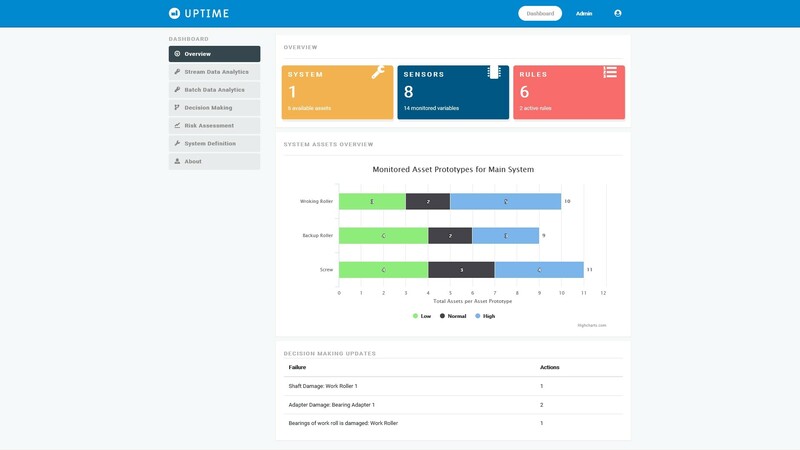 The UPTIME Platform has been designed according to Systems Engineering principles to address both generic and specific user needs & technical requirements. The platform architecture accommodates different specific needs as demonstrated by its six main modules. UPTIME_SENSE: Collecting heterogeneous streaming data and uplifting them to the UPTIME Platform. UPTIME_DETECT & UPTIME_PREDICT: Analysing streaming data and providing predictions for future behaviour such as imminent failures or interruption of equipment. UPTIME_ANALYZE: Collecting static and legacy data, aligning and using them to provide analytics based on historical behaviour as well as providing predictions. UPTIME_DECIDE: Producing maintenance strategies based on cost estimation and predictions provided by UPTIME_PREDICT & UPTIME_ANALYZE. UPTIME_FMECA: Assessing risk of the components and overall equipment through dynamically updated results from UPTIME_PREDICT, UPTIME_ANALYZE & UPTIME_DECIDE. 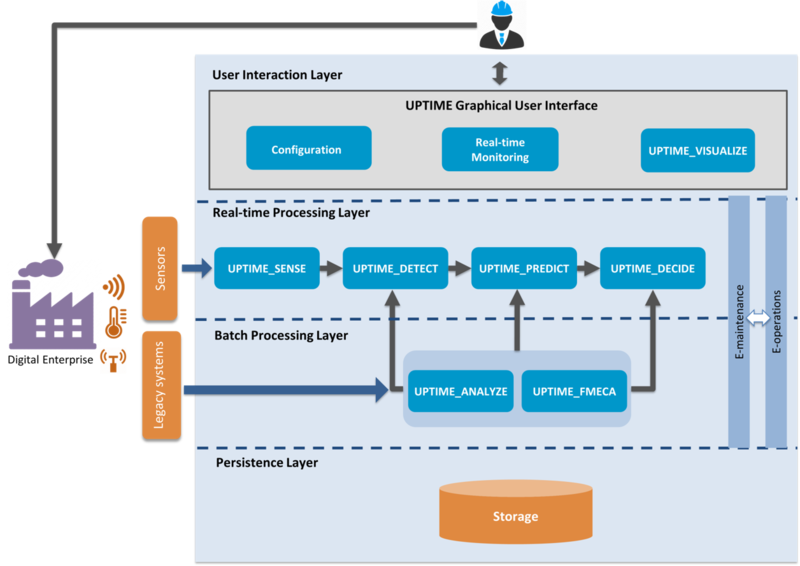 UPTIME_VISUALIZE: Providing general and specific visual analytics and information graphs, which can be parameterized by the user. Currently, the first prototype of the UPTIME modules have been integrated into the first version of the UPTIME Platform. The constituting modules of the platform were extended and unified in order to meet the defined business, system and technical requirements. Stream Data Analytics: It visualises the results of the deployed algorithmic calculations on data streams in order to be able to display the identified current condition of technical equipment of each business case and to provide predictions in an effective and user friendly way. Batch Data Analytics: In the context of batch data analytics, the UPTIME Platform leverage both legacy data and operational data related to maintenance by displaying them through various tools. Decision Making: It is responsible for providing recommendations about proactive actions based on predicted failures. At first, a set of configurable rules and actions are available to the user. Subsequently, the platform provides to the user the option either to reject that action or to approve it and consequently to add it in a maintenance plan. Risk Assessment: It denotes the criticality of the system components. The FMECA methodology is fully reflected into this process and the system definition part, as all the failure concepts (failure mode, failure effects, failure causes etc.) are defined. System Definition: The system definition constitutes the core part of the UPTIME Platform instantiation, as the definition of all aspects regarding the systems and components of each business case production line as well as the relevant failure concepts(e.g. failure modes, failure causes, failure effects etc.) can be inserted into the platform. Moreover, the UPTIME Platform provides to the user the capability of manipulating this information at any time, according to specific industrial needs. The modular UPTIME Platform provides a set of functionalities to the user, in which you can build your own use case depending on your needs. Contact us to see how to make it work in your context.